Airship Ventures: Home Sweet Home? But there's one group of Americans that know more than the average Joe about airships - the communities surrounding the former airship bases. Here, it’s difficult to escape the subject because the sheer size of the omnipresent hangars begs the question about what they used to house, and the constant stream of ‘what the heck shall we do with them now’ stories that feature in local rags, keeps the memory of the old rigid airships (like the Macon, Akron and Shenandoah) and more modern military blimps, alive. A community in Tustin, CA, recently faced their monuments. The weather had deteriorated one historic hangar beyond economic repair, leading to a decision to demolish it, and the other is now going to become part of a new development. The community surrounding Moffett Field in the Bay Area, CA, also live with the presence of these monster homes for airships on their doorstep. Hangar One* is part of the Bay Area landscape, an incredible structure with no less incredible debates going on about its reuse. NASA Ames manages the airfield, including Hangars 2 and 3 which are the same as those in Tustin, and has had studies done on the potential reuse, but to date, nothing has been firmed up. 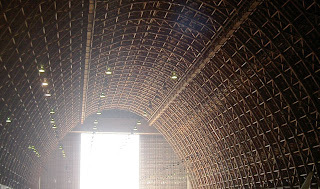 Hangars 2 and 3, and the structures at Tustin are remarkable for the fact that they are built almost entirely of wood because all the metal was being used in the war effort. Its a remarkable thing to see these vast structures with their criss cross bracing. We’re just glad that there’s a few of these big structures left. After all, our Zeppelin will need a home……..
* not the Vodka named Hangar One, although I'm sure that's part of the Bay Area landscape too.